For other uses, see New World (disambiguation). The phrase gained prominence after the publication of a pamphlet titled Mundus Novus attributed to Italian explorer Amerigo Vespucci. The Americas were also referred to as the "fourth part of the world". One can speak of the "New World" in a historical context, e.g., when discussing the voyages of Christopher Columbus, the Spanish conquest of Yucatán and other events of the colonial period. For lack of alternatives, the term is also still useful to those discussing issues that concern the Americas and the nearby oceanic islands, such as Bermuda and Clipperton Island, collectively. The term "New World" is used in a biological context, when one speaks of Old World (Palearctic, Afrotropic) and New World species (Nearctic, Neotropic). Biological taxonomists often attach the "New World" label to groups of species that are found exclusively in the Americas, to distinguish them from their counterparts in the "Old World" (Europe, Africa and Asia), e.g. New World monkeys, New World vultures, New World warblers. The label is also often used in agriculture. Asia, Africa, and Europe share a common agricultural history stemming from the Neolithic Revolution, and the same domesticated plants and animals spread through these three continents thousands of years ago, making them largely indistinct and useful to classify together as "Old World". Common Old World crops (e.g., barley, lentils, oats, peas, rye, wheat), and domesticated animals (e.g., cattle, chickens, goats, horses, pigs, sheep) did not exist in the Americas until they were introduced by post-Columbian contact in the 1490s (see "Columbian Exchange"). Conversely, many common crops were originally domesticated in the Americas before they spread worldwide after Columbian contact, and are still often referred to as "New World crops"; common beans (phaseolus), maize, and squash – the "three sisters" – as well as the avocado, tomato, and wide varieties of capsicum (bell pepper, chili pepper, etc. ), and the turkey were originally domesticated by pre-Columbian peoples in Mesoamerica, while agriculturalists in the Andean region of South America brought forth the cassava, peanut, potato, quinoa and domesticated animals like the alpaca, guinea pig and llama. Other famous New World crops include the cashew, cocoa, rubber, sunflower, tobacco, and vanilla, and fruits like the guava, papaya and pineapple. There are rare instances of overlap, e.g., the calabash (bottle-gourd), cotton, and yam, and the dog, are believed to have been domesticated separately in both the Old and New World, their early forms possibly brought along by Paleo-Indians from Asia during the last glacial period. The term "New World" ("Mundus Novus") was first coined by the Florentine explorer Amerigo Vespucci, in a letter written to his friend and former patron Lorenzo di Pier Francesco de' Medici in the Spring of 1503, and published (in Latin) in 1503–04 under the title Mundus Novus. Vespucci's letter contains arguably the first explicit articulation in print of the hypothesis that the lands discovered by European navigators to the west were not the edges of Asia, as asserted by Christopher Columbus, but rather an entirely different continent, a "New World". The Italian-born Spanish chronicler Peter Martyr d'Anghiera often shares credit with Vespucci for designating the Americas as a new world. 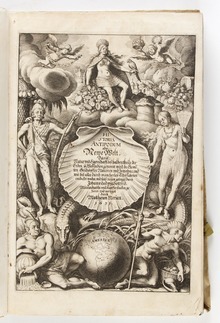 Peter Martyr used the term Orbe Novo (literally, "New Globe", but often translated as "New World") in the title of his history of the discovery of the Americas as a whole, which began to appear in 1511 (cosmologically, "orbis" as used here refers to the whole hemisphere, while "mundus" refers to the land within it). 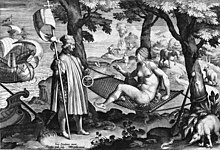 Peter Martyr had been writing and circulating private letters commenting on Columbus's discoveries since 1493 and, from the start, doubted Columbus's claims to have reached East Asia ("the Indies"), and consequently came up with alternative names to refer to them. Only a few weeks after Columbus's return from his first voyage, Peter Martyr wrote letters referring to Columbus's discovered lands as the "western antipodes" ("antipodibus occiduis", letter of May 14, 1493), the "new hemisphere of the earth" ("novo terrarum hemisphaerio", September 13, 1493), and in a letter dated November 1, 1493, refers to Columbus as the "discoverer of the new globe" ("Colonus ille novi orbis repertor"). A year later (October 20, 1494), Peter Martyr again refers to the marvels of the New Globe ("Novo Orbe") and the "Western hemisphere. "("ab occidente hemisphero"). The Vespucci passage above applied the "New World" label to merely the continental landmass of South America. At the time, most of the continent of North America was not yet discovered, and Vespucci's comments did not eliminate the possibility that the islands of the Antilles discovered earlier by Christopher Columbus might still be the eastern edges of Asia, as Columbus continued to insist down to his dying day. A critical step in the transition was the conference of navigators (Junta de Navegantes) assembled by the Spanish monarchs at Toro in 1505, and continued at Burgos in 1508, to digest all existing information about the Indies, come to an agreement on what had really been discovered, and set out the future goals of Spanish exploration. Amerigo Vespucci attended both conferences, and seems to have had an outsized influence on them – Vespucci ended up being appointed the first piloto mayor, the chief of the navigation of Spain, at Burgos. Although the proceedings of the Toro-Burgos conferences are missing, it is almost certain that Vespucci articulated his recent "New World" thesis to his fellow navigators there. It was during these conferences when Spanish officials seem to have finally accepted that the Antilles and the known stretch of Central America were definitely not the Indies they had originally sought, and Columbus had insisted they were, and set out the new goal for Spanish explorers: to find a sea passage or strait through the Americas which would permit them to sail to Asia proper. In English usage the term "New World" was problematic and only accepted by relatively late. While it became generally accepted after Vespucci that Columbus's discoveries were not Asia but a "New World", the geographic relationship between the two continents was still unclear. That there must be a large ocean between Asia and the Americas was implied by the known existence of vast continuous sea along the coasts of East Asia. Given the size of the Earth as calculated by Eratosthenes this left a large space between Asia and the newly discovered lands. Even prior to Vespucci, several maps, e.g. the Cantino planisphere of 1502 and the Canerio map of 1504, placed a large open ocean between China on the east side of the map, and the inchoate largely water-surrounded North American and South American discoveries on the western side of map. However, out of uncertainty, they depicted a finger of the Asian land mass stretching across the top to the eastern edge of the map, suggesting it carried over into the western hemisphere (e.g. the Cantino Planisphere denotes Greenland as "Punta d'Asia" – "edge of Asia"). Some maps, e.g. the 1506 Contarini–Rosselli map and the 1508 Johannes Ruysch map, bowing to Ptolemaic authority and Columbus's assertions, have the northern Asian landmass stretching well into the western hemisphere and merging with known North America (Labrador, Newfoundland, etc.). These maps place the island of Japan near Cuba and leave the South American continent – Vespucci's "New World" proper – detached and floating below by itself. The Waldseemüller map of 1507, which accompanied the famous Cosmographiae Introductio volume (which includes reprints of Vespucci's letters) comes closest to modernity by placing a completely open sea (with no stretching land fingers) between Asia on the eastern side and the New World (being represented two times in the same map in a different way: with and without a sea passage in the middle of what is now named Central America) on the western side – which (on what is now named South America) that same map famously labels simply "America". However, Martin Waldseemüller's map of 1516 retreats considerably from his earlier map and back to classical authority, with the Asian land mass merging into North America (which he now calls Terra de Cuba Asie partis), and quietly drops the "America" label from South America, calling it merely Terra incognita. The western coast of the New World – the Pacific Ocean – was only discovered in 1513 by Vasco Núñez de Balboa. But it would take a few more years – Ferdinand Magellan's voyage of 1519–22 – to determine that the Pacific definitely formed a single large body of water separating Asia from the Americas. It would be several more years before the Pacific Coast of North America was mapped, dispelling lingering doubts. Until the discovery of the Bering Straits in the 17th century, there was no absolute confirmation that Asia and North America were not connected, and some European maps of the 16th century still continued to hopefully depict North America connected by a land bridge to Asia (e.g. the 1533 Johannes Schöner globe). ^ Mundus Novus: Letter to Lorenzo Pietro Di Medici, by Amerigo Vespucci; translation by George Tyler Northrup, Princeton University Press; 1916. ^ "Real Differences: New World vs Old World Wine". Wine Folly. 21 August 2012. ^ This preliminary letter from Bezeguiche was not published, but remained in manuscript form. It is reproduced in F.A. de Varnhagen (1865: pp. 78–82). ^ Varnhagen, Amerígo Vespucci (1865: pp. 13–26) provides side-by-side reproductions of both the 1503 Latin version Mundus Novus, and the 1507 Italian re-translation "El Nuovo Mondo de Lengue Spagnole interpretato in Idioma Ro. Libro Quinto" (from Paesi Nuovamente retrovati). The Latin version of Mundus Novus was reprinted many times (see Varnhagen, 1865: p. 9 for a list of early reprints). ^ S.E. Morison The European Discovery of America, v.2: The southern voyages, 1492–1616. (1974: pp. 265–66). ^ Sobecki, Sebastian (2015). "New World Discovery". Oxford Handbooks Online. doi:10.1093/oxfordhb/9780199935338.001.0001 (inactive 2018-05-19). Retrieved 2 June 2016. ^ Verrazzano, Giovanni da (1524). "The Written Record of the Voyage of 1524 of Giovanni da Verrazzano as recorded in a letter to Francis I, King of France, July 8th, 1524" Archived 2006-09-08 at the Wayback Machine. Citing: Wroth, Lawrence C., ed. (1970). The Voyages of Giovanni da Verrazzano, 1524–1528. Yale, pp. 133–43. Citing: a translation by Susan Tarrow of the Cèllere Codex. Look up New Worlder or Western Hemispherian in Wiktionary, the free dictionary. This page was last edited on 13 April 2019, at 06:17 (UTC).